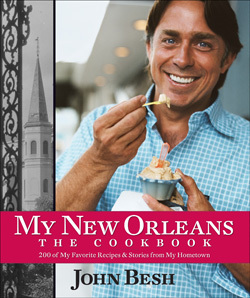 The new cookbook from New Orleans Chef John Besh arrived at more doorstep just in the nick of time. In time to fill my head with dreams of Belle River Crawfish Pie, Crab-and-Shrimp Stuffed Flounder, Busters and Grits, Oyster and Artichoke Soup and Old-Fashioned Double-Crusted Blackberry Pie. And, just in time, before I board a plane tomorrow with a good gal pal in tow to take on the Big Easy in high style. A stop at Besh's Restaurant August is part of the plan, as is Friday lunch at Galatoire's, live jazz, voodoo trinket shops, cafe au lait and beignets at Cafe du Monde, and a Sazerac or two just to round out the whole experience.